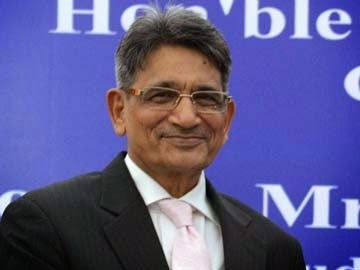 Lexengine: Justice R. M. Lodha: the 41st CJI of India. Justice Rajendra Mal Lodha was on Sunday sworn in as the 41st Chief Justice of India. He was administered the oath of office by President Pranab Mukharjee at the Rashtrapati Bhavan. At 64, Justice Lodha is the senior-most judge of the Supreme Court after Justice Sathasivam. He will have a brief tenure of five months as the Chief Justice as he is scheduled to retire on September 27. In the high courts, the process is initiated by the respective chief justices. In the Supreme Court, the Chief Justice of India (CJI) takes the initiative. The final decision is taken by five Supreme Court judges, including the CJI. Article 124 deals with the appointment of Supreme Court judges. It says the appointment should be made by the President after consultation with such judges of the High Courts and the Supreme Court as the President may deem necessary. The CJI is to be consulted in all appointments, except his or her own. Article 217 deals with the appointment of High Court judges. It says a judge should be appointed by the President after consultation with the CJI and the Governor of the state. The Chief Justice of the High Court concerned too should be consulted. How and when did the other system evolve? The collegium system has its genesis in a series of three judgments that is now clubbed together as the “Three Judges Cases”. The S P Gupta case (December 30, 1981) is called the “First Judges Case”. It declared that the “primacy” of the CJI’s recommendation to the President can be refused for “cogent reasons”. This brought a paradigm shift in favour of the executive having primacy over the judiciary in judicial appointments for the next 12 years. How final was this? Justice Verma’s majority judgment saw dissent within the bench itself on the individual role of the CJI. In a total of five judgments delivered in the Second Judges case, Justice Verma spoke for only himself and four other judges. Justice Pandian and Justice Kuldip Singh went on to write individual judgments supporting the majority view. But Justice Ahmadi had dissented and Justice Punchhi took the view that the CJI need not restrict himself to just two judges (as mentioned in the ruling) and can consult any number of judges if he wants to, or none at all.For the next five years, there was confusion on the roles of the CJI and the two judges in judicial appointments and transfers. In many cases, CJIs took unilateral decisions without consulting two colleagues. Besides, the President became only an approver. What was done to deal with the confusion? In 1998, President K R Narayanan issued a presidential reference to the Supreme Court as to what the term “consultation” really means in Articles 124, 217 and 222 (transfer of HC judges) of the Constitution. The question was if the term “consultation” requires consultation with a number of judges in forming the CJI’s opinion, or whether the sole opinion of the CJI constituted the meaning of the articles. In reply, the Supreme Court laid down nine guidelines for the functioning of the coram for appointments/transfers; this came to be the present form of the collegiums.Besides, a judgment dated October 28, 1998, written by Justice S P Bharucha at the head of the nine-judge bench, used the opportunity to strongly reinforce the concept of “primacy” of the highest judiciary over the executive. This was the “Third Judges Case”. What are the arguments against the collegium system? Experts point to systemic errors such as:* The administrative burden of appointing and transferring judges without a separate secretariat or intelligence-gathering mechanism dedicated to collection of and checking personal and professional backgrounds of prospective appointees;* A closed-door affair without a formal and transparent system;* The limitation of the collegium’s field of choice to the senior-most judges from the High Court for appointments to the Supreme Court, overlooking several talented junior judges and advocates. What moves were taken to correct these? The Law Commission in its 214th Report on ‘Proposal for Reconsideration of Judges cases I, II and III’ recommended two solutions:* To seek a reconsideration of the three judgments before the Supreme Court. * A law to restore the primacy of the Chief Justice of India and the power of the executive to make appointments. What is the suggested alternative to the collegium? A National Judicial Commission remains a proposal. The Constitution (98th Amendment) Bill was introduced in the Lok Sabha by the NDA government in 2003. It provided for the constitution of an NJC to be chaired by the CJI and with two of the senior-most judges of the Supreme Court as its members. The Union Law Minister would be a member along with an eminent citizen to be nominated by the President in consultation with the Prime Minister. The Commission would decide the appointment and transfer of judges and probe cases of misconduct by judges, including those from the highest judiciary.